Splash Data, a company based in the United States, publishes a list every year of the “worst” passwords. These passwords are bad because they are the most stolen passwords on the Internet. 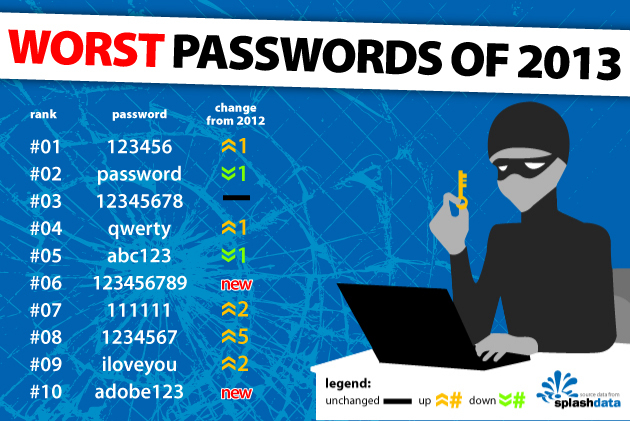 Splash Data recently published its list for 2013, and the worst of all the worst passwords was “123456” followed by “password”, “12345678”, “qwerty”, and “abc123”. So the next time you have to select a password, make sure it’s not any of the above! One of Splash Data’s products is an application that manages passwords.